Experiential marketing has played an important roll in the brand marketing mix for years and is evolving to the consumer market. Millennials affinity for experiences over material goods is spilling over into other generations, and is impacting how marketers interact with consumers. Marketing isn’t just about product plus branding anymore. Every single touchpoint with consumers – from the first ad they see through to the consumption of the product – matters now more than ever. Marketers are tasked with not only pushing products or services, but cutting through the clutter to create a fully branded experience. Best-in-class brands are speaking to their consumers through their preferred medium, elevating customer service and creating positive interaction that fosters ongoing loyalty. An emerging vessel of experiential marketing is brand activation through a visual medium. Authenticate your environment through interactive graphics. Wall murals, artwork and displays can turn into community events when you invite others to share in creating art and messaging through visual displays. Our Speedpr0 partner in Chicago created a 20’ canvas for the Special Olympics which offered a color-by-number-inspired template for attendees to color and connect with each other and the organization, while paying tribute to the games. Brands seeking authentic connections with their audiences are increasingly identifying this type of experiential graphics to cut through the digital noise and create meaningful engagement to further draw attention to the organization. Pop up shops, bars, salons and more are cropping up everywhere. It’s a splashy limited-time-only promotional idea that provides brands immediate engagement with consumers to showcase their products or services while strengthening their brand. Businesses can transform a commercial space into a brand activation platform by creating an immersive brand experience. Speedpro Imaging – Marin teamed up with an agency partner to create a pop-up retail space for Tonal, a new tech-savvy fitness product. They seized the opportunity to build out a pop-up location for two weeks over the winter holidays – the busiest shopping period of the year. Using environmental graphics, including wall murals, window graphics and dimensional signs, the space was transformed into an interactive showroom for Tonal to engage and educate consumers about their product. Ultimately, the experiential marketing campaign provided Tonal valuable access to consumers and provided the company great exposure – all part of their product launch. Although pop-up concepts aren’t new, brands are finding new applications, particularly with e-commerce companies finding partnerships with brick-and-mortar locations to give their customers a new experience and face-to-face interaction. Engagement and interaction with target audiences. The University of California at San Francisco Benioff Children’s Hospital of Oakland recently built a new outpatient center for children and their family members. They enlisted the help of a SpeedPro partner studio. The studio used artwork that was created by kids at the hospital to design nearly 80 wall murals. All of the artwork was small scale, hand-drawn painted pieces on 8.5” x 11” paper. The artwork was digitized through a high-quality scanner and printed off each piece at roughly 12.5 feet wide and at varying heights to install them as wall murals in more than 70 rooms throughout the hospital. The texture of the watercolors on paper in the scanned digital file came through on the final product, making this a very successful community-based project. The artwork transformed the spaces from ordinary into something welcoming, comforting and familiar. We anticipate more brands integrating this graphic form in the coming year. Environmental graphics are about transforming spaces to connect “people and place”. Innovative use of technology and materials is opening up a world of options for marketers. Contour cutter/router (CNC) machines have created new opportunities for customized signage décor, utilizing wood, acrylic, aluminum. The CNC allows SpeedPro Imaging studios to contour cut virtually any shape and size, whether it be dimensional letters or custom configurations, all while using using multiple materials. Companies can create branded furniture or standees for a retail or event activation using a wide range of materials. Companies can also create Instagram-worthy moments. As an example, a SpeedPro partner studio built a larger-than-life-size version of the American Marketing Association’s logo during the organization’s annual conference. Impossible to miss, this 3D display also served as a focal point for selfies and group photos throughout the event. These innovative applications of wide-format printing transcend one-dimensional graphics and allow brands to garner more audience attention. Point of purchase displays in the past tended to be less-than-inspiring in terms of creativity. But with new technology and equipment, POP displays are more dynamic both in look and functionality. POP displays will increasingly play a key role for retail brand’s attempts to engage customers and generate sales. For example, a SpeedPro Imaging – Marin recently did a project for Salesforce, creating large contour cutout displays. The Silicon Valley brand’s mascots are a mixture of cartoonish critters and people. For this particular project, the SpeedPro team printed and contour cut dozens of large critters and replicated San Francisco street signs – all for a large Dreamforce event. These types of displays can be used as temporary or permanent display fixtures for one-off events or office decor & branding. Environmental graphics continue to be the fastest growing sector in large format as new materials and printer capabilities evolve. Architectural and interior design firms are increasingly introducing environmental graphics to their corporate clients. The integration of architecture design and graphics is on full display at many tech companies such as LinkedIn, Twitter, Uber – the list goes on. For a growing number of brands, wall coverings are the ideal solution due to dozens of textured options. Textured media such as suede, plaster, silk and smooth. There are also PVC free materials, which are ideal for schools and hospitals. Wall coverings are also more durable and can last for more than 10 years. Felt is an increasingly popular option for offices and can be applied to a wall or hung as a space divider. Felt is also a highly textured material which can enhance office environments. the material come in dozens of different colors and designs – all can be contour cut into shapes of and size. Felt also has an acoustic component, helping reduce noise levels in working environments. 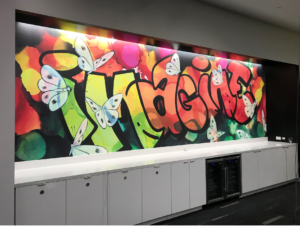 Brands looking to add a dynamic element to a their environment – whether it be an office or a retail space – frequently turn to wall murals or wall coverings. Increasingly, some brands are opting for a different form of graphic imagery such as replication of wood, concrete or brick. For example, SpeedPro Imaging – Marin recently produced a graphic rebrand for Hewlett-Packard’s Customer Welcome Center. 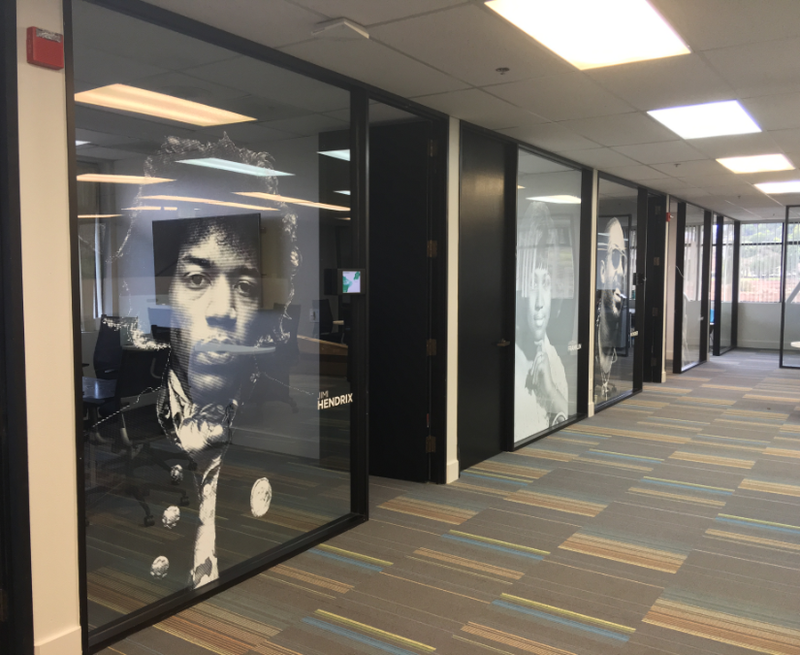 The tech company sought out a solution to create a a more exciting and vibrant look, while also showcasing their printer technology. Initially, HP enlisted a graffiti artist to create the imagery for a 40-foot wall. Speedpro Marin printed a 25-foot textured wall covering as a black brick façade, creating a look of a wall painted 20 years ago. The combination of graffiti-style artwork with the textured wall covering conveyed a hip, forward-thinking brand that has its finger on the pulse of technology and pop culture. Blended into the center of the wall mural was a 10’ x 6’ digital screen for customer presentations.. Think of any open surface as an opportunity for brand messaging. Floors might seem counter-intuitive for branding. But if you think about it, we all look down a lot more then we realize. A ceiling doesn’t have to be a blank space. A door or a mirror can offer a creative opportunity. Grabbing attention is the whole point so the more unique, the better. Any investment in experiential graphics needs to be weighed against your marketing goals and brand values. Brand, location, audience and budget will ultimately dictate what works best for your company. Make no mistake, experiential graphics are a key element in any marketing program or event. Consider some of the 2019 Trends listed here as starting points four your next project! Contact the team at Speedpro Imaging – Marin to discuss options for your event, office or retail signage needs. Awesome service, very quick turn around from design to finish product! Good quality products ! We will come back to do more business . Thank you guys. Fast friendly service... takes the time to make sure you get the right solution for your needs & maintains a keen eye for detail in producing quality products. We worked with Wing on our company's truck's graphics from design to installation and she was fantastic. Always very professional, worked with me through a number of requests, and the trucks look beautiful.